With the help of our expert engineers, we have been able to manufacture and supply a qualitative range of chain pulley blocks. These are precisely engineered using finest quality components sourced from reliable vendors of the industry. Owing to dimensional accuracy, durability and sturdiness, these blocks are widely used as a perfect material handling equipment. One can avail these blocks at reasonable rates. 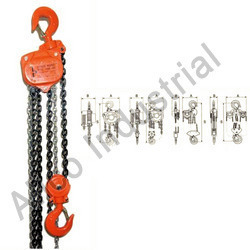 Backed by rich industry experience as well as services of experienced industry professionals, we have successfully emerged as a leading name in the field of supplying a wide range of Industrial Tools, Machines and Associated Accessories. With our business tie-ups with leading manufacturers, dealer we ensure these products are backed by desired quality standards as well as match up with the specific process application needs of our customers. Consistently working hard and retaining our current position as well as status in the industry, we are well recognized in the market for delivering technologically advanced range of products as demanded by our customers. Further, this exclusive & broad range of products including hand tools, electric power tools, electric tools and electric measuring equipments are precision designed to successfully meet the defined industry standards. For delivering quality products, we import these products from top manufacturers all across the globe. Some of the industries these find application in include Heavy-Engineering Industry, Aerospace, Automotive industry & their ancillaries, Mining, Marine, Shipping Industry, Trucking, Railways, Motor-Sport, Indian Defense and Electrical & Electronics Industry. Further, we also serve the demands of industries like Petro-Chemicals, Plastics, Wind Energy & Turbines, Gas Industry and Garages & Workshops.